Mercerville, NJ, - Players Committee Inc, a charity that works with students to help overcome social anxiety, has received a $10,000 grant from the MassMutual Foundation as part of a national Community Service Award (CSA) program. Players Committee Inc is one of twenty-two organizations nationally to receive an award. 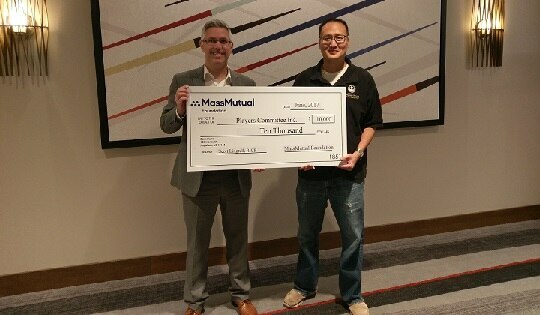 The MassMutual Foundation made the grant as a tribute to the volunteer efforts of Scott Lingrell, a MassMutual agent with Jaraiedi Financial Group in Lawrenceville, NJ. The Players Committee mission is to use games as a way to teach kids about game theory, math, critical (and creative) thinking, along with sportsmanship, fair play, and a sense of community. In doing this, it helps kids overcome social anxiety and brings people with different backgrounds together over one common interest. Scott has been with Jaraiedi Financial Group for 15 years. He has been committed to Players Committee Inc since 2008 and has dedicated countless hours of time and talent to help the organization grow and flourish. MassMutual is a leading mutual life insurance company that that is run for the benefit of its members and participating policy owners. MassMutual offers a wide range of financial products and services, including life insurance, disability income insurance, long term care insurance, annuities, retirement plans and other employee benefits. For more information, visit www.massmutual.com.